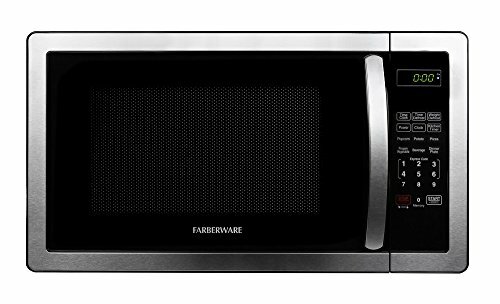 The Farberware classic microwave delivers power, style and convenience with a sleek design to compliment your kitchen. Features include 10 power levels and a memory function that stores and recalls your preferred cooking settings. The Farberware classic offers an easy to operate digital interface with 1-6 minute express cook buttons, time or weight based defrost controls, an add 30-Seconds control, as well as six pre-programmed cooking functions for popcorn, pizza, a dinner plate and more. Multi-stage cooking means that you can set the power level to adjust during the cooking cycle for perfect results without interruption. The LCD display provides a clock and kitchen timer. With a generous 1.1 Cubic foot cooking Capacity, 1000 watts of power, and a rotating turntable, the Farberware classic is the perfect multi-tasker for your kitchen.